John Mosler is an artist and sculptor based in Brooklyn, New York. For the past 20 years, John has had the privilege of creating his work in the studio of renowned Ceramic Artist, Toshiko Takaezu (b 1923) who was famously known for her closed formed vessels and elevating ceramics from the production of functional vessels to a fine art. Takaezu paved a path for fine artists to freely express through the medium of clay. 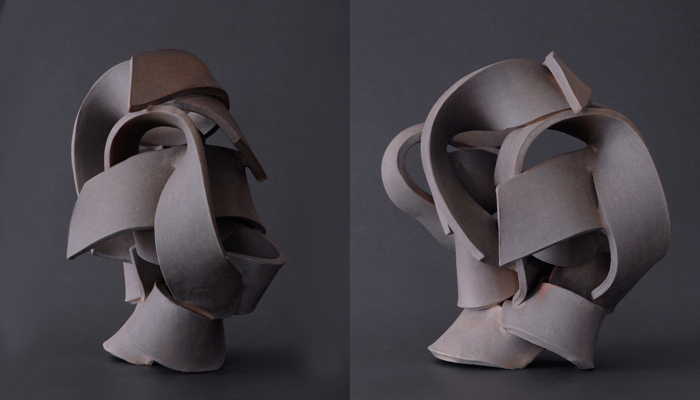 It was in the Takaezu Studio where John Mosler extensively explored the inherent characteristics and offerings of clay, embracing and working within it's existing property restrictions while coupling and founding innovative techniques, allowing the material to expand into uniquely impossible forms. Mosler's "impossible forms" not only push the technical boundaries of clay as a medium, as far as ancient times has signified, but also seeks to provide an elastic and kinetic viewer experience both physically and emotionally through the created form. Mosler's work, in the round, is a journey through the human condition and its intrinsic dualities. With every movement exists the intention to seek an impassable existence and reaches towards a strong yet tenuous connection imploring safety until the actuality continues on. Mosler's work has been featured in the New York Times and is in prestigious Art Collections around the world.